Ready for a MINI adventure? 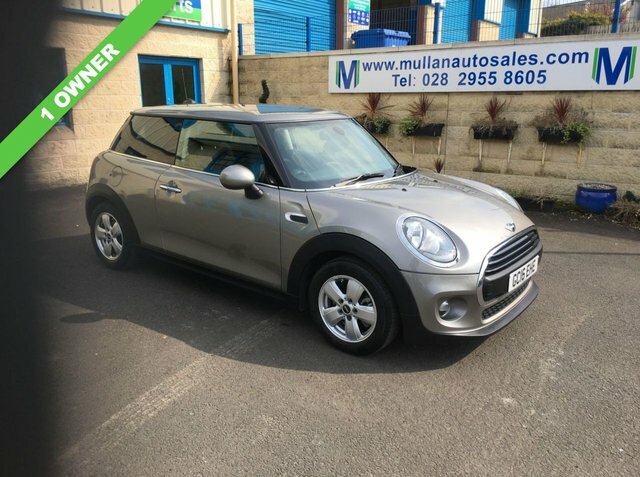 Pay a visit to Mullan Auto Sales Ltd today and take a closer look at the full range of used MINI cars for sale in Coleraine. Whether you're looking for a fun city runabout like the MINI 3-Door Hatch or a stylish cabriolet such as the MINI Convertible, our team is ready and waiting to help. We stock affordable used cars to suit every budget and you can buy with confidence as each one of our vehicles is thoroughly inspected before going on sale. Discover more or arrange to take a test drive in the used MINI of your choice by contacting a member of the team at Mullan Auto Sales Ltd today. Finance is available to UK residents aged 18 years or older, subject to status. Terms & Conditions apply. Indemnities may be required. Other finance offers may be available but cannot be used in conjunction with this offer. We work with a number of carefully selected credit providers who may be able to offer you finance for your purchase, commission may be received. We are only able to offer finance products from these providers. Postal Address: Mullan Auto Sales Ltd, 10-12 Carhill Road, Garvagh, Coleraine, County Londonderry BT51 5NJ. Find contact details here. Mullan Auto Sales Ltd is authorised and regulated by the Financial Conduct Authority, FRN: 729142. All finance is subject to status and income. Written Quotation on request. We act as a credit broker not a lender. We work with a number of carefully selected credit providers who may be able to offer you finance for your purchase. We are only able to offer finance products from these providers.